Ostrów Lubelski [ˈɔstruf luˈbɛlskʲi] is a town in Gmina Ostrów Lubelski in Lubartów County, Lublin Voivodeship in Poland. Within the territory of the town and commune there are three lakes: Miejskie Lake, Kleszczów Lake and Czarne Lake. The commune is a typically agricultural area. It is constituted by 1,009 farms and 167 plots of ground. 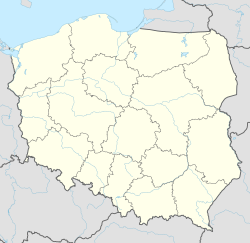 Ostrów Lubelski belongs to the historic province of Lesser Poland. The majority of farms are not concentrated on one particular kind of production; some specialise in cattle breeding for export, others in poultry breeding (geese, ducks), and yet others in pig breeding. Climate and water supplies are favourable for agriculture. In addition to grain, farms also grow herbs (thyme, lovage, camomile and mallow) and oil plants. "Ostrów" derives from a Slavic word meaning "island". On January 25, 1548 King Sigismund the Old granted a foundation privilege to Ostrów along with a privilege of hereditary office to Wacław Grzymała, a nobleman. At that time the area of Ostrów stretched over 1985 hectares. Ostrów became a royal town, holding a right to organise Saturday fairs and collecting duty on the road from Lublin to Parczew. The fact that it was located on the Polish-Lithuanian route was advantageous for the development of trade and consequently the town. In 1565 the population of Ostrów numbered about 1800 inhabitants, mostly Poles. It was one of the five most densely populated towns in the Lublin Voivodeship at that time. Apart from Lublin, Kazimierz was another town with bigger population than Ostrów. Łuków and Parczew had nearly the same number of inhabitants. In 1589, in order to increase the colonisation, King Sigismund III granted Ostrów a right to organise three fairs a week. In spite of that, the importance of Ostrów decreased in the following decade. Polish-Ukrainian wars, the Swedish Flood as well as numerous conflicts and the greed of starosties resulted in a considerable deterioration of the town. The devastation of Ostrów by the troops of Moszkowski, Capitain of Horse, in 1657 was one of major factors contributing to its collapse. The number of population decreased to 300 people. The period of rule by Electors of Saxony witnessed further degradation of the town, in particular the years 1712-1717, when its inhabitants were forced to bear the expense of maintaining troops, although Ostrów was never a battlefield. This situation resulted in the mass exodus of its inhabitants. In 1718 the population of Ostrów numbered only 20. During the Partition period an administrative status of Ostrów altered several times. It functioned as a royal town until 1864, when the Russian government renamed it into a settlers commune. In 1923 a part of Tyśmienica commune was annexed to Ostrów commune. The commune population numbered over 8000 people in 1923. During the First World War Ostrów was completely devastated and its population decreased to 2100 inhabitants. The Germans, who occupied it for four years, (1914–1918) did not permit to rebuild it. The census of 1919 recorded 4648 people. At that time Ostrów was a village commune. After Poland regained its independence in 1918, the inhabitants of Ostrów pronounced their plea for Ostrów to regain its status as a town. On the strength of the Decree of the Minister of Internal Affairs, Thugutt, by the terms of the Resolution of the Executive Seym of July 22, 1919, by the Decree of the State Commander of February 4, 1919 Ostrów became a town. Municipal administration was formed. The first election to the Town Council was carried out in 1920 and Aleksander Samulik became a mayor of Ostrów. In the same year Ostrów was completely devastated and robbed by the Bolsheviks, depriving its inhabitants of all their property. The town suffered from the aftermath of the German-Russian war. Even a church was not saved. To commemorate this occasion bullets were built in the church walls. The period between the First World War and the Second World War was a period of prosperity. Ostrów was rebuilt and developed (concrete pavements along town squares, a bridge over the Tyśmienica, a school, community house, fourteen new streets). At that time Ostrów was much overpopulated. In 1928 fire destroyed its buildings. In 1930 there lived 4879 people, including a high percentage of the Jewish population. While Poles were mostly peasants, local Jews took up crafts and trade. The cultural and economic development of Ostrów was terminated by an outbreak of the Second World War. The entire Jewish population was murdered in the Holocaust. This page was last edited on 26 November 2017, at 04:10 (UTC).